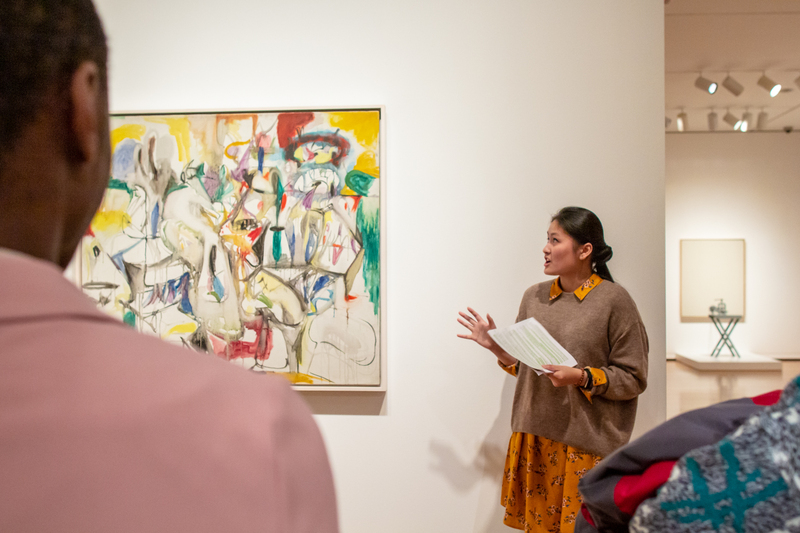 Read all about Trang Tran’s experience at SAM as our 2018 Emerging Arts Intern. The Emerging Arts Internship at SAM grew out of SAM’s equity goal and became a paid 10-week position at the museum designed to provide emerging arts leaders from diverse backgrounds with an in-depth understanding of SAM’s operations, programming and audiences. We’re searching for our next Emerging Arts Intern! Does this sound like you? Applications are due April 1! When I was asked to write a wrap-up blog about my experiences as an Emerging Arts Leader intern at the Seattle Art Museum, I asked myself, “Jeez, where do I even begin?” There are so many experiences, memories, and relationships that I have built at this museum, a place I now consider a second home, that it’s hard to summarize my journey in a paragraph or two. As I was walking toward the museum on my first day of the internship, the word “anxious” wouldn’t have entirely encapsulated my emotions. I was also thrilled, grateful, and honored to be working at one of the best art institutions on the West coast. My first week flew by as I met staff members who were inclusive, welcoming, supportive, and helpful as I tried to find my way around the maze of the administrative office. Over the next weeks, I began conducting informal interviews with staff members, working on projects with the curatorial, communication, and educational departments, and I ran around the museum trying to find meeting rooms but repeatedly ending up on the wrong floor (“M stands for Maloney”– David). I also toured the Olympic Sculpture Park (Thanks, Maggie! ), made multiple trips to the galleries and library as I began research for my December My Favorite Things Tour, spiraled down the rabbit hole in art storage (Thanks, Carrie! ), attempted to write a press release for an upcoming exhibition (Thanks, Rachel! ), participated in many events hosted by the museum, and more! One event I was especially honored to participate in was the Peacock in the Desert: The Royal Arts of Jodpur, India Community Opening Celebration. I had the opportunity to interact with the community by greeting them at the door and answering questions about the evening’s programs. Instead of running around the administrative office or staring at a computer screen, I was able to engage with the museum’s audience. It was amazing to witness the enthusiasm, anticipation, and joy radiating from everyone I met at the door. Even though I ended up losing my voice that night, I wouldn’t trade the experience for anything. I was also fortunate to spend the day with my little brother, Kevin, at the Diwali Family Festival. Diwali, or the “festival of lights,” is one of the most important celebrations in India where people celebrate the triumph of good over evil. The museum’s annual Diwali Family Festival included a vibrant fashion show, numerous art activities, dance performances, live music, and tours of the special exhibition, Peacock in the Desert, as well as tours of SAM’s permanent collections and installations. By attending this event, I hoped to show my brother that art is not just about color pigments on a white canvas on the wall or a sculpture encased in glass that you forget about as soon as you walk away. Art has the effect of bringing people together. People of different ethnicities, cultures, and backgrounds come together to celebrate, learn about, and appreciate a culture. Art also has the power to encapsulate political struggles, social changes, cultural values, and art movements. These are the reasons why I love, and am passionate, about art. I hope that if I can help the youngest member of my family see how powerful art can be, maybe one day my parents, as well as the wider Asian-American community, will learn to accept and recognize the existence of the art world. Throughout this 10-week interdisciplinary internship, I found myself learning about the numerous operations that keep the museum running on an everyday basis. Such operations range from researching artworks in the curatorial department to fundraising in the development department, from promotional strategies in the marketing department to writing press releases in the communication department, and from preserving artworks in the conservation department to engaging the public in the educational department. But if I were to selected one main lesson to take away after this internship, it would be that a museum is not just about the artworks in the gallery; it’s also about people coming together to successfully bring these artworks to the public. For an artwork to be displayed in the museum, for a sculpture to be standing in the gallery, or for an exhibition to be showcased for three months, it takes cooperation from every department in the museum. From the bottom of my heart, thank you to everyone who has welcomed, accepted, supported, challenged, and encouraged me throughout this internship. Thank you for all the hard work that you are doing, not only for the world of art, but also for the public community. 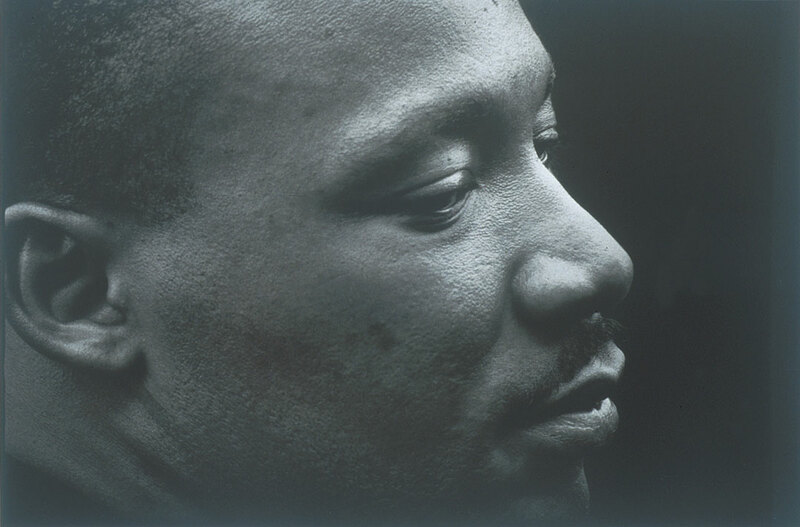 Every January, SAM honors Dr. Martin Luther King, Jr. with a week of spotlight tours led by museum staff, focused on artists and artworks currently on view in SAM’s galleries that speak to themes of race and social justice. Free and open to the public, the tours are also a big draw for SAM administrative staff, who step away from their desks on the fifth floor and head down to hear from one of their colleagues. 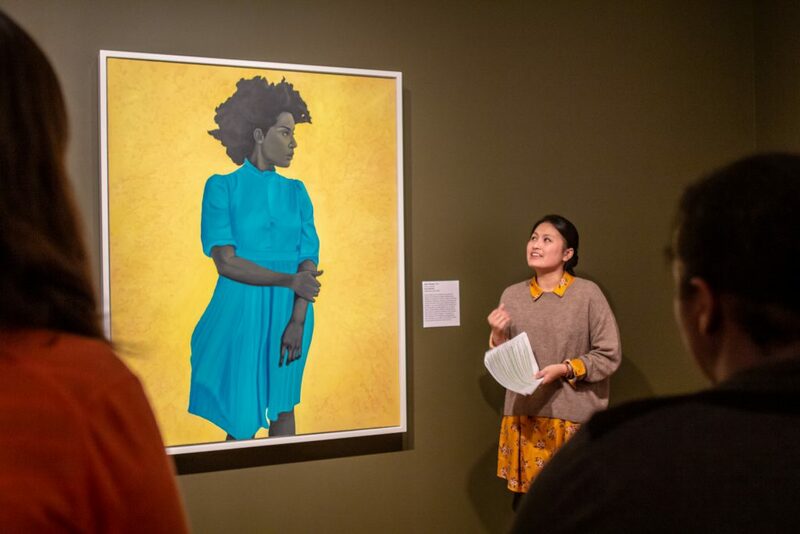 Grounded in a love for, and knowledge of, the collection, the tours are often deeply personal, as the speaker finds resonances in the art with their own experiences of race and social justice. Since launching the series in 2015, there have been many memorable tours. In 2017, Public Engagement Associate David Rue danced his tour in front of Robert Colescott’s Les Demoiselles d’Alabama: Vestidas, a major work by the Black artist that had been recently been brought into the museum’s collection. He moved to the sounds of The Shirelles’ “Will You Still Love Me Tomorrow,” simultaneously celebrating the increased visibility of Black artists and wondering whether it was just lip service—or the beginning of a new future of true equity. Actress and performance artist (and SAM Visitor Services Officer) Adera Gandy led a tour in 2018 that visited the current show Lessons from the Institute of Empathy. Anchored by an immersive installation by contemporary artist Saya Woolfalk, the show includes works selected by the artist from SAM’s African art collection. Adera focused on Fulani and Ghanaian gold jewelry, reminding us that just as practitioners of alchemy attempted to find a universal elixir by turning base metals into gold, we must work towards equity not only with external steps—measurable policies and practices—but with internal shifts to transform the collective mind and create authentic and sustainable change. In 2019, Social Media and Communications Coordinator Nina Dubinsky visited the current installation Body Language and discussed Akio Takamori’s ceramic sculpture Willy B. It’s inspired by a famous 1970 photo of German Chancellor Willy Brandt kneeling down and silently bowing his head at a monument to the thousands of Poles killed in the Warsaw Ghetto Uprising of 1943. Nina connected Takamori’s interest in this evocative gesture as a political statement to her generation’s use of social media to unite in social movements, such as #BlackLivesMatter, #MeToo, #TransRightsMatter, and #MuteRKelly. 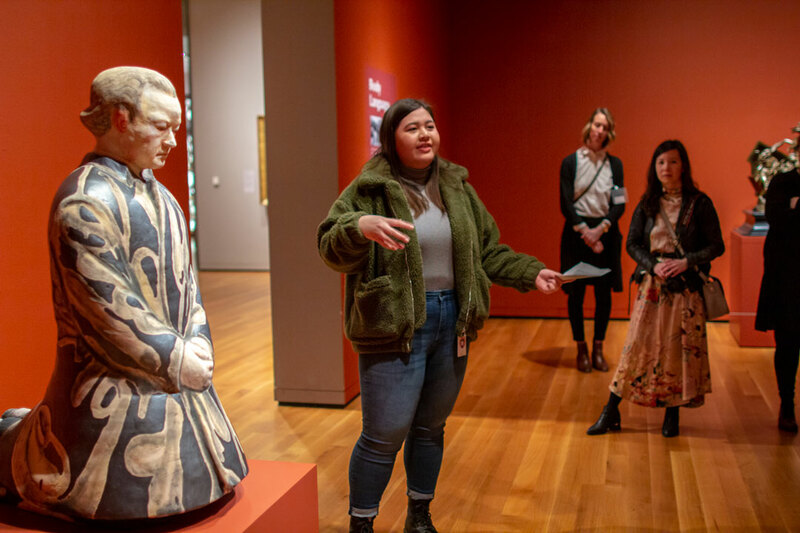 Also this year, we expanded the series beyond staff to include tours by Dr. Cherry Banks, a SAM trustee and Professor in Education Studies at the University of Washington Bothell, and Celeste Ericsson, a SAM docent who participates in the SAM docent corps’ Equity Working Group. 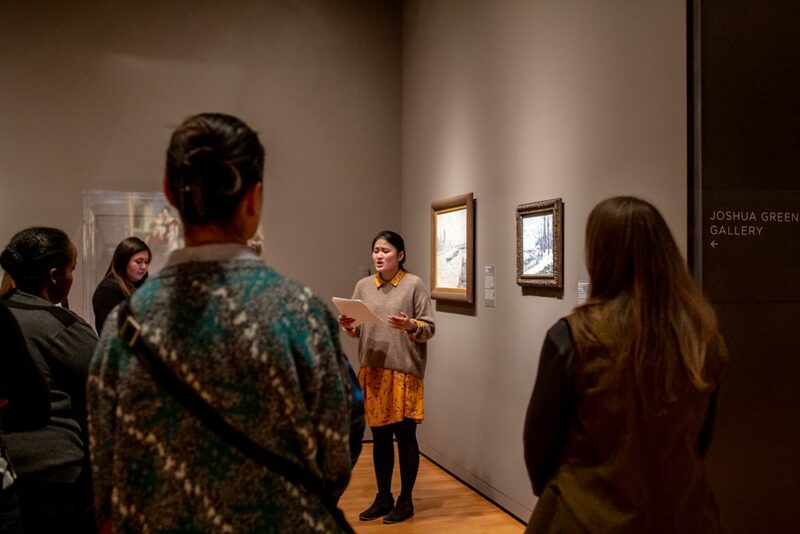 The Art and Social Justice Tours continue to change the way we all experience the works in our collection. Including more perspectives only deepens their impact. Join us next year when we continue this tradition of honoring the radical and loving legacy of Dr. Martin Luther King, Jr. The image is unrelenting is its focus, framing Dr. King’s face so that he takes up over half of the composition. King, glancing down and to the side, bears a calm demeanor—stoic and pensive. Surely he would have been surrounded by a large group of friends and colleagues, or even a crowd of fellow activists, but Budnik denies us any context in which to situate King. Without the title of the photograph, Dr. Martin Luther King Jr. after Delivering His “I Have a Dream” Speech, August, 1963, we would have no way to know that this image portrays him after one of the most important speeches in American history. I accept this award today with an abiding faith in America and an audacious faith in the future of mankind. I refuse to accept despair as the final response to the ambiguities of history. I refuse to accept the idea that the “is-ness” of man’s present nature makes him morally incapable of reaching up for the eternal “ought-ness” that forever confronts him. I refuse to accept the idea that man is mere flotsom and jetsom in the river of life unable to influence the unfolding events which surround him. I refuse to accept the view that mankind is so tragically bound to the starless midnight of racism and war that the bright daybreak of peace and brotherhood can never become a reality. I refuse to accept the cynical notion that nation after nation must spiral down a militaristic stairway into the hell of thermonuclear destruction. I believe that unarmed truth and unconditional love will have the final word in reality. This is why right temporarily defeated is stronger than evil triumphant. I believe that even amid today’s motor bursts and whining bullets, there is still hope for a brighter tomorrow. I believe that wounded justice, lying prostrate on the blood-flowing streets of our nations, can be lifted from this dust of shame to reign supreme among the children of men. I have the audacity to believe that peoples everywhere can have three meals a day for their bodies, education and culture for their minds, and dignity, equality and freedom for their spirits. I believe that what self-centered men have torn down, men other-centered can build up. . . . This faith can give us courage to face the uncertainties of the future. It will give our tired feet new strength as we continue our forward stride toward the city of freedom. When our days become dreary with low-hovering clouds and our nights become darker than a thousand midnights, we will know that we are living in the creative turmoil of a genuine civilization struggling to be born. 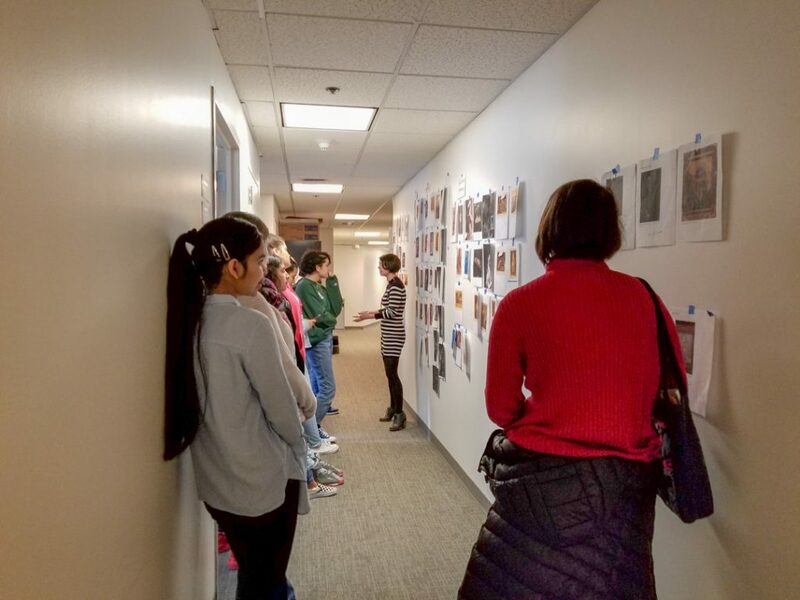 Over the years, SAM has from time to time brought together a group of community members from diverse backgrounds and affiliations to advise on the presentation of a special exhibition. In 2009, SAM met with leaders of the city’s South Asian community when a set of exquisite royal paintings from Jodhpur would be presented at the Seattle Asian Art Museum. A group of fashion designers and instructors advised the museum—and helped create a fashion show featuring local designers at the museum—for SAM’s fall 2016 exhibition celebrating the work of the legendary Yves Saint Laurent. These, and numerous other examples, signify the importance to SAM of connecting with people outside of the organization to fulfill its mission of reflecting the community it serves. This ethos guides much of SAM’s work already; for example, the Education & Public Engagement Division nurtures ongoing relationships with local artists, performers, writers, and other culture-makers in presenting dynamic programming and events. Now it’s official: going forward, the museum will bring this community-centered process to the development of all major special exhibitions presented throughout the year, convening Advisory Committees who will meet and advise the museum throughout the planning process. A major impetus for making this process official? The deeply rewarding experience working with an advisory committee for Double Exposure: Edward S. Curtis, Marianne Nicolson, Tracy Rector, Will Wilson (June 14–September 9, 2018). As plans for this major exhibition came together, it was clear that the complex subject matter would require thoughtful execution at every step. The exhibition would be held for the sesquicentennial of the birth of photographer Edward S. Curtis (1868–1952), but far from a celebration, SAM would present a richly nuanced re-evaluation of his legacy. “While Curtis made many contributions to the fields of art and ethnography, his romanticized picture of Native identity has cast a lingering shadow over the perception of Native peoples,” noted Barbara Brotherton, SAM’s Curator of Native American Art. “Today, Indigenous artists are creating aesthetic archives reclaiming agency over their visual representation.” Brotherton worked with three contemporary Indigenous artists—Marianne Nicolson, Tracy Rector, and Will Wilson—to conceive of Double Exposure, an exhibition that would thread their works in conversation with Curtis’ iconic photographs, as well as objects from SAM’s collection. This collaboration between curator and contemporary artists also included the advisory committee, whose feedback helped make space at the museum for a reckoning with Curtis’s legacy. With Double Exposure, SAM took a big step in its efforts to decolonize the museum. We’d like to acknowledge the committee members once again: Dr. Charlotte Coté (Tseshaht / Nuu-chah-nulth First Nation), Jarrod Da (San Ildefonso Pueblo), Colleen Echohawk-Hayashi (Pawnee Nation / Upper Ahtna Athabascan), Andy Everson (K’ómoks First Nation), Jason Gobin (Tulalip Tribe), Darrell Hillaire (Lummi Nation), Madrienne Salgado (Muckleshoot Tribe), Lydia Sigo (Suquamish Tribe), Asia Tail (Cherokee Nation), and Ken Workman (Duwamish Tribe). To bring together the advisory committees, invitations are sent to leaders, artists, and thinkers whose own work and communities are reflected in the particular themes of an exhibition. 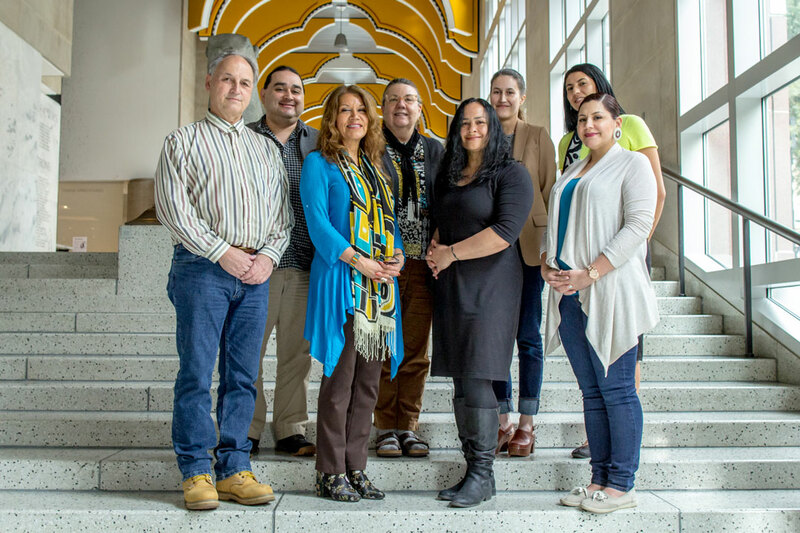 These selections are drawn from SAM’s already-rich network of partnerships and more importantly provide opportunities to create new connections with community leaders and organizations in the region. Reflecting the value of this work, and ensuring that the opportunity to serve is accessible to everyone, SAM offers a stipend to all committee members. Each committee meets with a cross-divisional group of SAM staff who are charged with taking the feedback and guidance of the members back to their colleagues. Interacting with each step of the exhibition-making process over the course of multiple meetings—including curatorial, marketing, education, and more—the committee’s input contributes to the development of exhibition content, communication, and interpretation. Advisory Committees for upcoming exhibitions are already at work. SAM is grateful for their dedication—and eager to experience how this community-centered model contributes to SAM’s mission to connect art to life. Photo: Natali Wiseman. Pictured, L to R: Ken Workman (Duwamish Tribe), Jarrod Da (San Ildefonso Pueblo), Dr. Charlotte Coté (Tseshaht / Nuu-chah-nulth First Nation), Curator of Native American Art Barbara Brotherton, Double Exposure artist Tracy Rector, Asia Tail (Cherokee Nation), Lydia Sigo (Suquamish Tribe), Madrienne Salgado (Muckleshoot Tribe). Not pictured: Colleen Echohawk-Hayashi (Pawnee Nation / Upper Ahtna Athabascan), Andy Everson (K’ómoks First Nation), Jason Gobin (Tulalip Tribe), Darrell Hillaire (Lummi Nation). As I walked towards the Seattle Art Museum to begin my Emerging Arts Leader internship, I was excited. I knew I would be working with the education and curatorial departments, but had only the minutest idea of what the internship would entail. At the staff entrance, I saw the other Emerging Arts Leader Intern for the summer nervously sitting on the couch. As Seohee Kim and I began to get to know each other, it was apparent we had many similarities. We are both passionate about immigrant rights and we both originally intended to take a law career track but found ourselves working in the arts, despite the initial backlash from our parents. I didn’t know it then, but Seohee and I would become an inseparable and fierce duo. Everyone we met was genuine, welcoming, caring, and passionate. I honestly could not believe my eyes, it seemed almost suspicious. The education department glows with kindness and a love for the Seattle Art Museum’s mission to connect art to life. I went to college in Connecticut, and although I was raised in Seattle, I didn’t have many friends or connections with the arts community. This quickly changed. I could share with you about how I gained professional experience using The Museum System to research and organize objects. I could tell you about the meetings I sat in on where my voice mattered and my opinions were valued. I could tell you how I learned about the behind-the-scenes work that most people don’t know about. I could tell you how this internship opened my eyes to a possible career path that I would’ve never known about prior to this summer: exhibition design. I could write about each of these topics, but I want to focus on the amazing events that allowed me to get involved with the Seattle community and touched my heart with the amount of support and healing that took place at these events. Three events, in particular, had a strong impact on me; the [Black] Power Summit, the Creative Advantage, and Remix. The Power Summit was a health and wellness conference for Seattle’s Black community. The first panel was one on mental health and mindfulness. The panel spoke about generational trauma and the stigma behind mental illness within the Black community. I could relate to these trends within the Latinx community. Often times, our parents work so hard to provide for our families that they dwell in survival mode. When we are raised in households where mental illnesses are stigmatized, we feel as if we are a burden to our family if we bring up issues we may be facing. As we keep hiding, the marble-sized issue becomes a bowling ball. One panelist suggested that we sit with our discomfort and strip it of its power over us. The trauma may still be present in the form of memories or thoughts, but it will no longer have power over our ability to thrive. If you’ve never been to Remix, just know you’re sleeping! Remix is a beautiful event in which many people come together to share the dance floor, art activities, tours, drinks, as well as their most fly outfits. I loved the art activities, but what really impacted me was the dancing. With performing artists such as the Purple Lemonade Collective, Bouton Volonté, and Randy Ford, the dance floor was throbbing with presence and beauty. When the dancers dipped, catwalked, and, yes, even twerked, a semi-circle formed around them of mainly white allies. Space was created for queer and trans people of color to exist, express their passion, make art, and share joy. As they created magic with their bodies, the viewers cheered and recorded, but mainly they yelled words of encouragement and awe. This wonderful space for marginalized groups to feel at ease within a large group of white folks didn’t feel uncomfortable or unwelcoming though. At that moment, race, gender, and sexuality were being praised and we were allowed to take up space with the knowledge that our allies are there to support us. If I wasn’t so busy sweating through my orange romper from all the dancing, I probably would have shed a tear of joy and love. The Seattle Art Museum is a highly inclusive environment that truly values racial equity. The institution is not building inclusive spaces or challenging our thinking because it is the trendy thing to do. The Seattle Art museum genuinely values equity work, from the director of the museum to interns like me and Seohee, and in between. This experience was one of healing for me after graduating from an institution on the East Coast that lacked passion for equality and often protests had to occur to demand visibility for underrepresented groups. The Seattle Art Museum is taking a stand and a leadership role to highlight and welcome all identities. 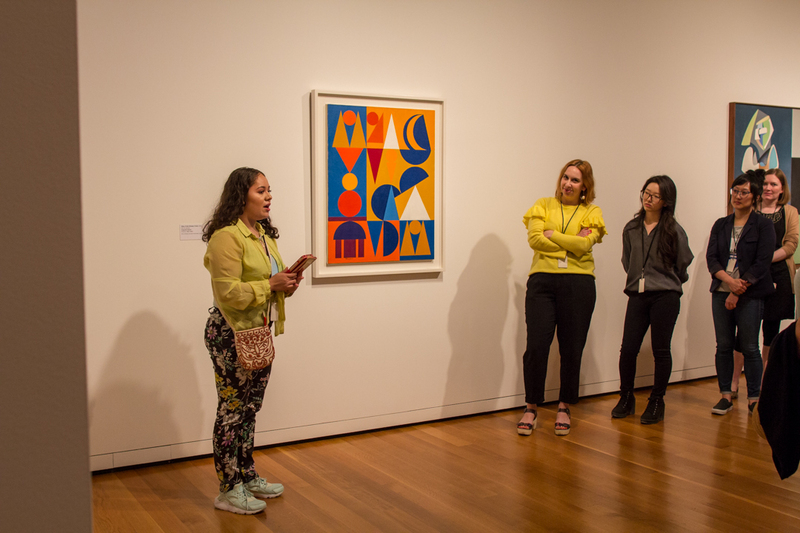 When the mission statement says that the Seattle Art Museum connects art to our lives, I understand that they connect art to our lives because they know that our lives matter and want to be a space for healing, learning, and unity. 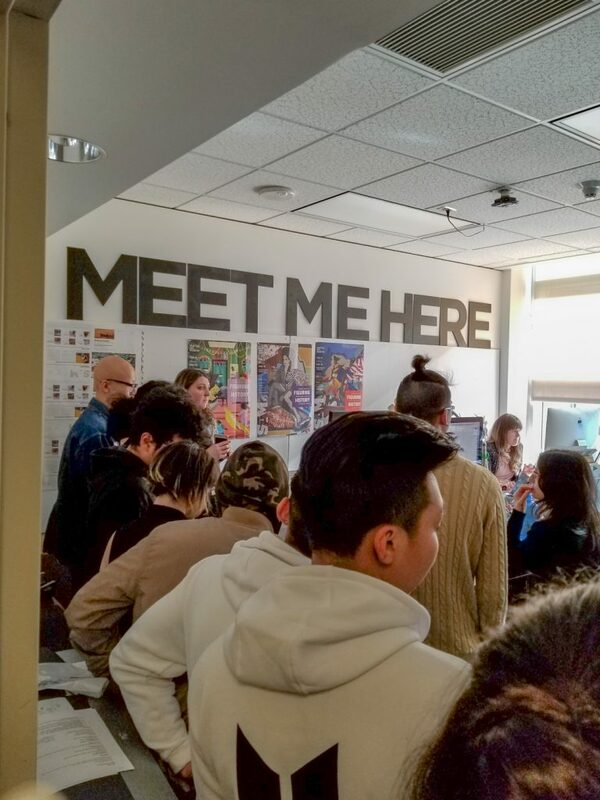 During Double Exposure: Edward S. Curtis, Marianne Nicolson, Tracy Rector, Will Wilson, the SAM social team took a few Friday afternoon field trips to visit other museums in Washington that are currently exhibiting work by Native artists. If you missed our Instagram stories, here’s a quick round up of a few exhibitions currently on view around the state that are not to be missed. Curated by RYAN! Feddersen and featuring art by Asia Tail and Fox Spears, we just had to stop by for more creative output from these artists who have also been involved with SAM during Double Exposure. 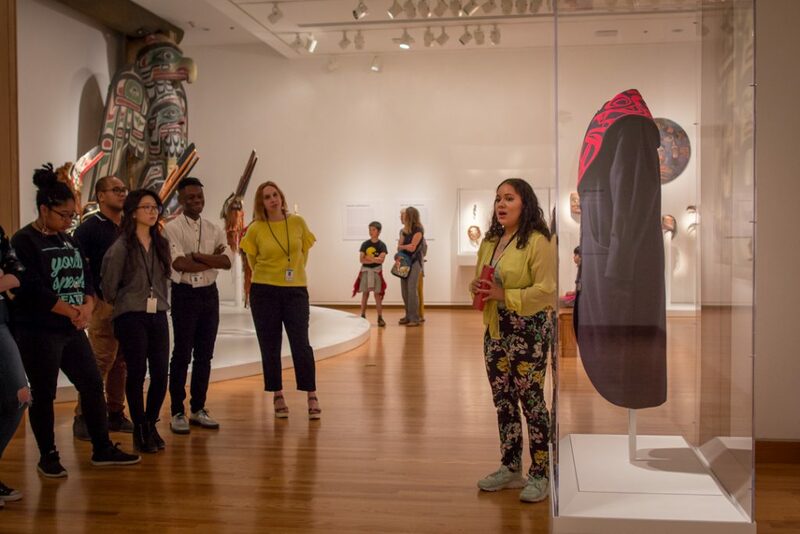 The collection of art on view offers a range of styles from contemporary Native artists in a variety of mediums by artists hailing from tribes across the extended Pacific Northwest and beyond. Feddersen is the mastermind behind the Post Human Archive, the social media activity that was installed at SAM. Asia Tail, also a curator (we can’t wait to see yəhaw̓ at the King Street Station opening in January 2019) is the hand behind the words on the Double Exposure website but we hadn’t seen her art previously! Fox Spears is one of the teaching artists offering free Drop-In Studio workshops at SAM (there’s one more workshop on Sunday led by Sondra Segundo before the exhibition closes) and it was so nice to see this work after learning so much about his process! The lens we look through changes everything. 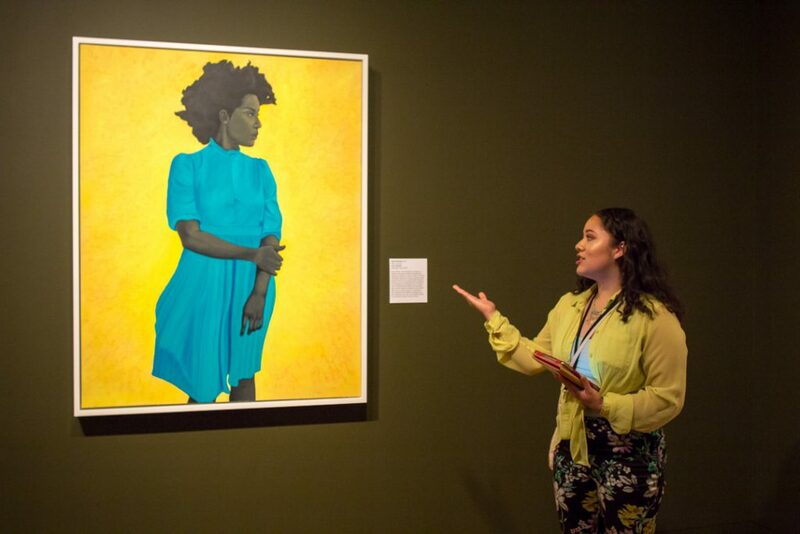 In Native Portraiture, Tacoma Art Museum asks the question: What is communicated when an outsider portrays someone from another culture? In the galleries you will have the chance to see contemporary Native artists representing Indigenous cultures for themselves. These works are interspersed by a few examples of depictions by non-Native artists that romanticize, stereotype, or appropriate Native people and cultures. We recommend spending at least an hour or two in this gallery to fully absorb the impact of this contrast. Do yourself a favor and enjoy the ferry and short drive that it takes to get to Suquamish Museum. Well designed and chock-full of information, the permanent installation tells a detailed and important story through movement, textures, the forest environment and the symbolic movement of the tide. 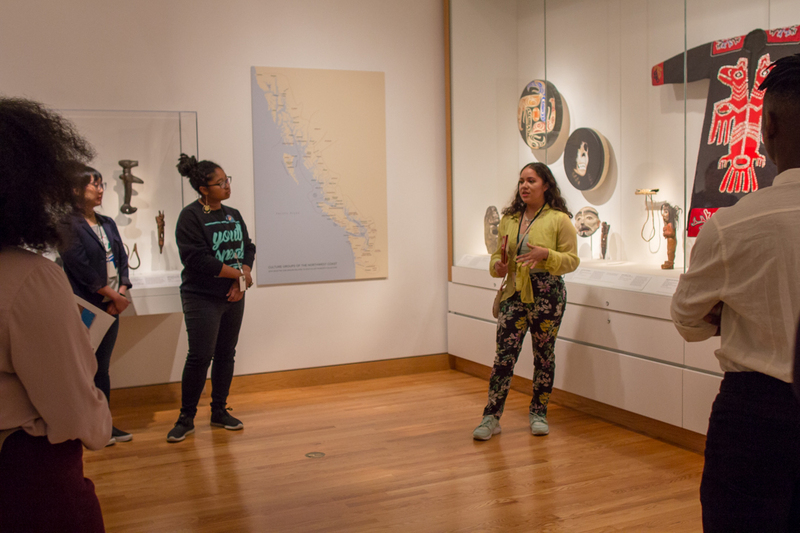 The objects on view, many never before exhibited, are a combination of works owned by the Suquamish Museum and on loan from Suquamish families and other museums. The way these objects are arranged creates an environment where you will want to spend some time. The museum describes their goal as an attempt to “displace the modern way of historical contextual understanding. Culture is more than historical events strung together. 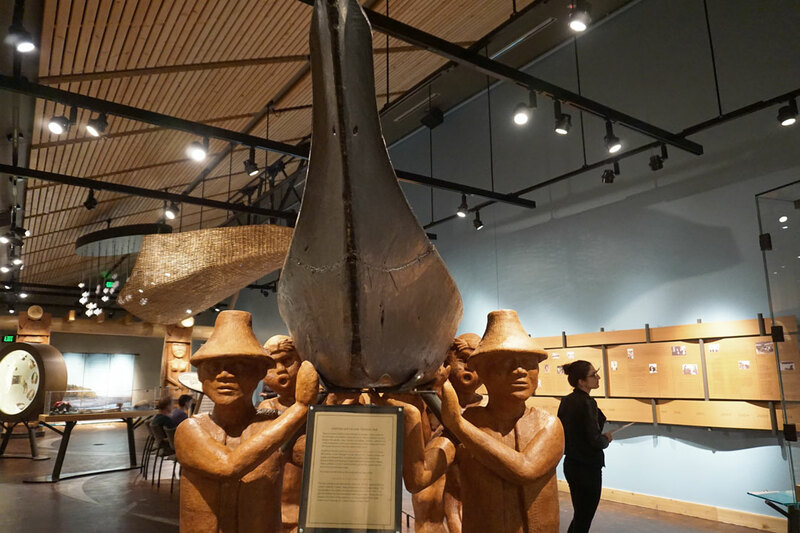 The passing of knowledge and values, generation to generation, is the core of Suquamish culture.” Based on our visit, the Suquamish achieves their goal, and then some! 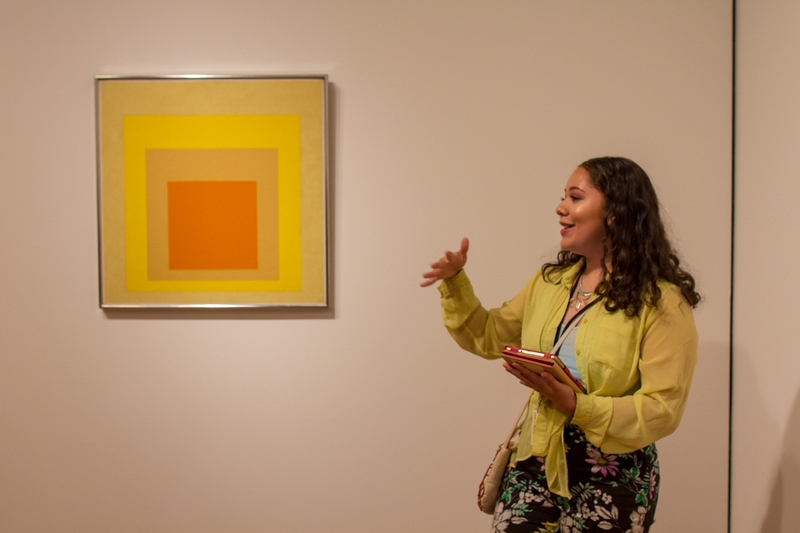 Where your day trips take you, SAM recommends you make the time to visit the wealth of museums in Washington featuring work by Native artists! Consider the value of contemporary Native art through the perspective of Seattle-based artist, curator, educator, and writer, C. Davida Ingram. Visit SAM’s Native Arts of the Americas galleries and the Art and Life Along the Northwest Coast installation to contextualize Sonny Assu’s Native formline design elements in his representation of Tony the Tiger or the “12 essential lies and deceptions” in his box of Lucky Beads. How does your perspective on food and access to land change as you consider the serious history behind this seemingly lighthearted artwork? Artwork: “Breakfast Series,” 2006, Sonny Assu (Gwa’gwa’da’ka), Kwakwaka’wakw, Laich-kwil-tach, Wei Wai Kai, born 1975, five boxes digitally printed with Fome-cor, 12 x 7 x 3 in. each, of 5, Gift of Rebecca and Alexander Stewart, in honor of the 75th Anniversary of the Seattle Art Museum, 2006.93, © Sonny Assu. Every artwork has a story. For our Object of the Week Tacoma-based artist Chris Jordan shares Charlotte Turner’s story and asks us to question what education looks like in the face of the violent history of the slave trade. Consider this and more when you visit SAM’s collection and see Needlework Sampler in person. Want to hear more from local artists and creative community members? Check out our My Favorite Things playlist on YouTube for more perspectives on SAM’s collections. What do you want to do when you grow up? SAM can help with the answer! Remember when you were in school and everyone nagged you about what you wanted to do when you grew up? You may have known, you may not have known, you may have thought you knew and ended up changing your mind. SAM’s High School Career Day programs differ from others by rejecting the notion that 15 and 16 year-olds need to know what they want to do for the rest of their lives. Instead we explore the vast career options within a museum whilst creating a space for students to feel okay with the unknown. SAM’s Equity Team’s Career Days center the interests of aspiring youth while involving staff from across departments and shedding light on the real people who navigate the creative, interesting, and sometimes odd, world of nonprofits, art, and museums. 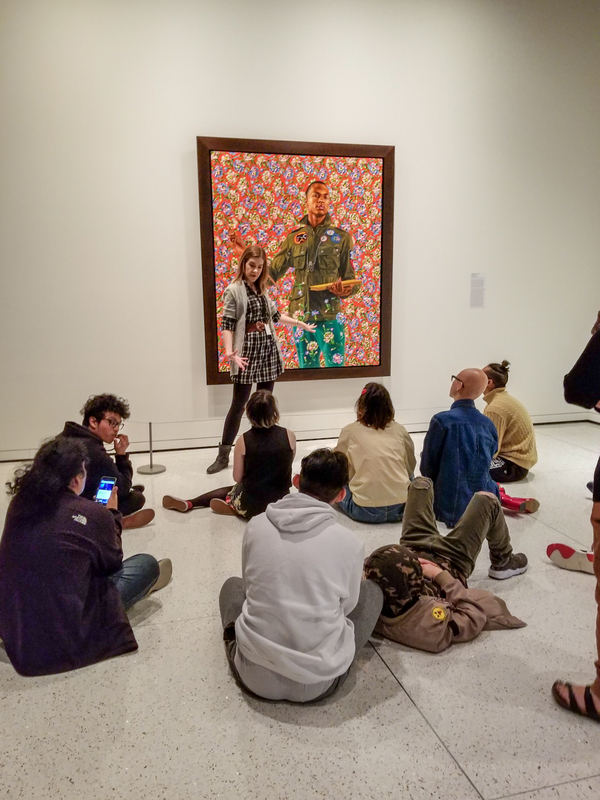 Students have heard from folks in SAM’s Education, Curatorial, Security, and Development departments, as well as from teaching artists, and more! 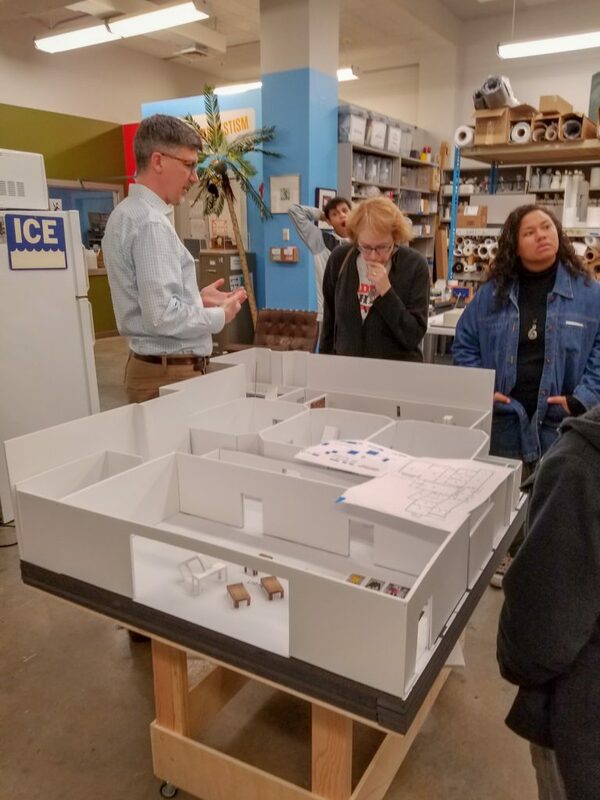 Our last Career Day on April 25, 2018 was with Mount Rainier High School and 85% of students said this experience helped them better understand their future career interests and plans for after high school. Nearly 70% of students said this experience helped them think about school in a new way, or motivated them to do better in school. Some of the students shared their thoughts with us after their visit! Our next Career Day is in November and we will continue to offer this program in the future. If you would like to bring your group to the museum for a Career Day experience, please email us!